1. Nominal size: Nominal diameter of the round section steel wire or bar from which the chain is made. 2. Material diameter: Diameter of the material in the chain link as measured. 3. Weld diameter: Diameter at the weld as measured. 4. Length dimensionally affected by welding: Length on either side of the center of the link, affected by welding. 5. Pitch: Internal length of a link as measured. 6. Manufacturing proof force(MPF) of chain: Force to which during manufacture the whole of the chain is subjected. 7. Breaking force( BF): Maximum force which the chain withstands during the course of a static tensile test to destruction. 8. 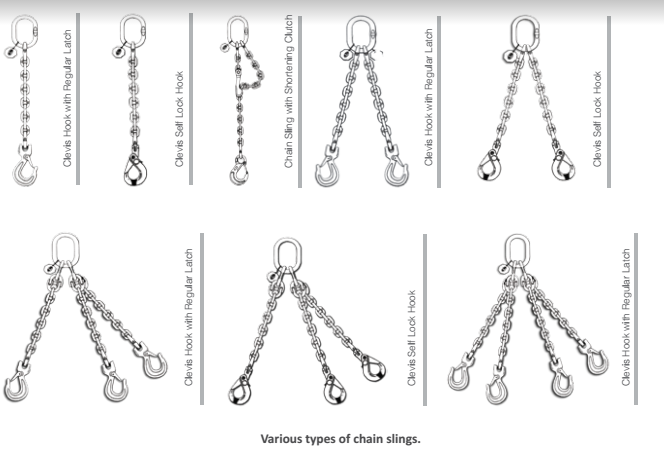 Working load limit (WLL) of chain: Maximum mass which the chain hanging vertically is authorized to sustain in general lifting service. 9. Total ultimate elongation (A): Total extension at the point of fracture of the chain expressed as a percentage of the internal length of the test sample. 10. Processing: Any treatment of the chain subsequent to welding, for example, heat treatment, polishing or dimension calibration. 11. Lot: Specified quantity from which test sample(s) is/are selected. 12. Competent person: A designated person, suitably trained qualified by knowledge and practical experience, and with the necessary instructions to enable the required examination to be carried out. Do not force, hammer or wedge chain slings or fittings into position; they must fit freely. Check the correct engagement of fittings and appliances. Do not lift on the point of the hook and ensure that the chain is not twisted or knotted.